On January 25, 2018, Roosh V — real name Daryush Valizadeh, a rank misogynist and denizen of the so-called “manosphere” — hosted a live-streamed discussion of “tradthots” in the far right. A “tradthot” is a female internet personality who preaches “traditional” values and gender roles while advocating a #tradright lifestyle, but who fails to adhere to those standards herself, as the underlying motivation isn’t ideology, but rather, the allure of financial and reputational gain. 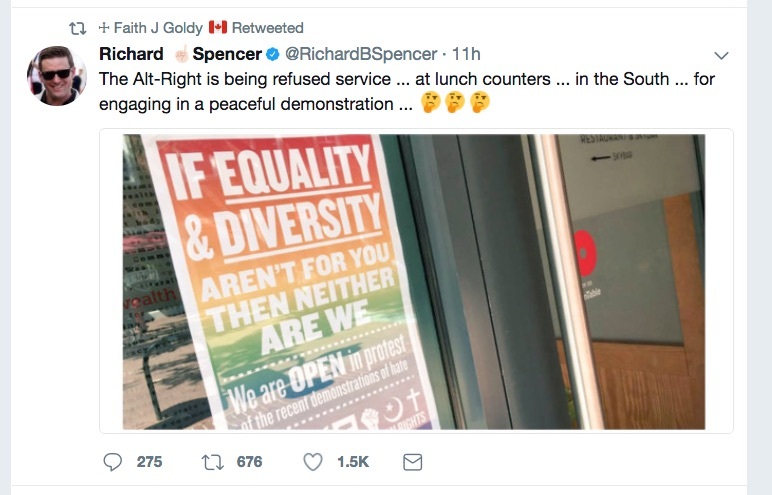 Gonzo journalist and conspiracy monger Laura Loomer, white nationalist podcaster Nicholas J. Fuentes, and far-right extremist Peter “Sweden” Imanuelsen were among the panel’s “special guests.” So, too, was Faith Goldy — the conservative commentator turned fringe-right propagandist turned neo-Nazi fellow traveller turned (for the moment) marginal candidate in Toronto’s mayoral election. Yet four months later, Goldy was crying persecution after Patreon notified her of her account’s termination due to violating its guidelines on hate speech. Indeed, abortion & the pill (read: the dethronement of God) was key in paving the way for replacement. Here’s an idea: Stop killing our children & replacing them with immigrants. These are the statistics of a vanishing race. That coming solution? A race war. As newsrooms weigh the merits of dedicating already scant resources to covering this marginal figure — one of 35 in the race for mayor — it’s worth noting the absence of pressure to do so with other insignificant candidates. That Goldy and her followers feel she is entitled to be considered equal to frontrunners John Tory and Jennifer Keesmaat doesn’t mean their delusions of grandeur need be indulged, and demands to treat this arguably bad-faith candidate as comparable to even second-tier personalities should be met with skepticism. After all, it was Goldy herself who positioned the media as “the enemy,” and as with other demagogues who routinely demean the free press, impartial and unbiased reporting will always fail to satisfy her demands. Moreover, efforts to over-compensate for a feared perception of bias can result in uncritical amplification of harmful misinformation which, in the end, does more damage to the reputation of journalism than would the media holding a consistent standard and refusing to be bullied into engaging on the terms of those acting in bad faith. Esteemed media veteran Ken Whyte, however, suggested the lack of attention paid to Goldy thus far was “antithetical to good journalism” and pointed to a lengthy Q&A by Graeme Gordon — a freelance journalist and frequent CANADALAND contributor — as “the most interesting and comprehensive thing I’ve seen on Toronto’s mayoralty campaign.” But when pressed by National Post columnist Chris Selley about what “story” was being missed, Whyte didn’t seem to have a meaningful answer. And though Whyte characterizes Goldy as a “populist” candidate, Goldy rejected that very frame just weeks before she announced her intention to run for mayor on July 27. Can we stop this meme? The zeitgeist sweeping European nations isn’t “populism”. “The zeitgeist that is sweeping us is not populism, it is [white] nationalism,” she told Infowars personality and host of The War Room, Jake Lloyd, in mid-June. Gordon wasn’t wrong to interview Goldy. His intent — to fill what he believed was a gap in campaign coverage — was sincere. His approach, however, was deeply flawed; it allowed her to control the discussion, offer evasive responses, and lie straight to his face with impunity. Goldy’s shameless exploitation of Gordon’s offer is standard practise for extremists and agitators. And note that it was his reputation that suffered a (momentary) blow, not hers, despite his subsequent introspection versus her unbridled mendacity. Just as NPR handed marginal white-supremacist Jason Kessler a victory of sorts by allowing him to argue his abhorrently racist beliefs unchallenged on air — thus presenting white supremacy as mere political opinion, of equal merit to the social justice and civil rights causes to which it is opposed — Gordon’s choice to publish a verbatim Q&A offered Goldy a propaganda coup. In May, Whitney Phillips, author of This Is Why We Can’t Have Nice Things: Mapping the Relationship Between Online Trolling and Internet Culture, published a comprehensive study into extremist manipulation of the media. One key observation was that when you allow such individuals to tell a story on their own terms, you grant them wide permission to edit the script. She recommends that to maintain proper control over discussions, one must “avoid deferring to manipulators’ chosen language, explanations, or justifications.” To do this effectively, you must know your subject well. When dealing with Goldy, ask specific, detailed questions, and be prepared to both recognize and challenge dishonest responses; be equipped with the facts and knowledge required to firmly counter and correct misinformation in real time. Goldy has, time and again, proven herself a dishonest broker — her word is simply not one you can trust. Goldy’s deliberate non-answer to the simple yes/no question of whether she believes there is a “white genocide” taking place — she does — is couched in demonstrable lies, confidently told, regarding her own embrace of that alt-right conspiracy theory, one notably common among neo-Nazis. What this respected and accomplished media figure doesn’t appreciate is that that approach is precisely how, over a two-year period, extremists were able to hijack news cycles and dominate the conversation to serve the interests of their respective hate groups — as well as then-candidate and now-President Donald Trump. It’s no coincidence that Trump’s administration is tied to — and in some areas, staffed by — anti-Muslim extremists, anti-immigration xenophobes, overt white nationalists, and fringe conspiracy theorists. Q: You know who else is a “traitor and coward”? Meanwhile, the suggestion that Goldy is “more than a minor” far-right figure is simply not accurate. Both ardent supporters and fierce critics grant her far more significance than she maintains, inflating her profile in ways she alone never could. Visible as she may be, she is neither prominent nor influential among the post-Charlottesville alt-right. She is in many ways a perpetual status-seeker, a far-right performance artist akin to Milo Yiannopoulos, but without his knack for the shtick. An admitted propagandist and nothing more, her role is to nudge the mainstream right ever further to the fringe in hopes of resetting where the political centre lies. She’s an agent provocateur who seeks chaos and courts outrage, and despite her lack of meaningful standing, her antics have resulted in real-world consequences. She whips up hysteria about immigrants, spreads lies about religious, racial, ethnic, and sexual minorities, and does so with gleeful enthusiasm, always at the expense of others. Between their commitment to multiculturalism (cultural relativism) & (third world) immigration, the Trudeau family has been the single greatest cancer to the national body that is Canada ?? She will remain useful to the alt-right so long as she’s able to reliably draw oversized backlash, as this, in turn, nets desired amplification and mainstream media attention. That’s not to suggest she should always be ignored. But when reporting on propagandists and other bad-faith actors — who will claim to have been misrepresented no matter how neutrally a story is presented — objectivity is crucial. And to objectively report on Goldy, one needs to know how to properly define where and for what she stands. Is she truly a “Nazi,” as many critics allege? After Charlottesville, J.M. Berger — a leading researcher, writer, and analyst on extremism — addressed the push to abandon what angry observers felt were euphemisms used to describe the presumed clear-cut “Nazis” of the alt-right. Berger is correct that, in carefully categorizing how people and ideologies fit in the broader scope — reserving the label of “neo-Nazi” for those to whom it truly applies, for instance — you’re not downplaying one element, but rather, you’re clearly defining another. And with this approach, you achieve deeper insights into each. Without a doubt, Goldy is a neo-Nazi sympathizer and fellow traveller. She dabbles in anti-Semitism, flirts with fascism, and carefully toes the line on the “JQ” (“Jewish Question”). These aren’t insults or epithets, but factual, demonstrable observations. That said, her endorsement of For My Legionaries — a book akin to Mein Kampf discussed in fascist forums, one you’ll find narrated at the Daily Stormer — during a chat with a fellow white nationalist, hinted at her shallow comprehension of the harder lines she espouses. Her swift walk-back of enthusiasm for the book fit a pattern of her blindly promoting extreme content in an effort to embellish her edge. 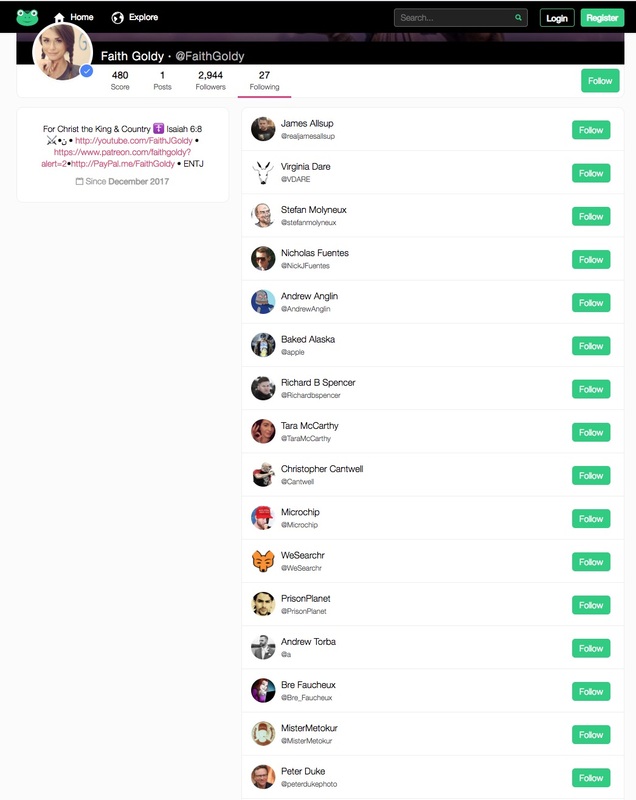 On Gab, a Twitter-like site catering to the far right, Faith Goldy follows such neo-Nazi personalities as Andrew Anglin, Richard Spencer, and Christopher Cantwell. That “hierarchy” being white racial supremacy. 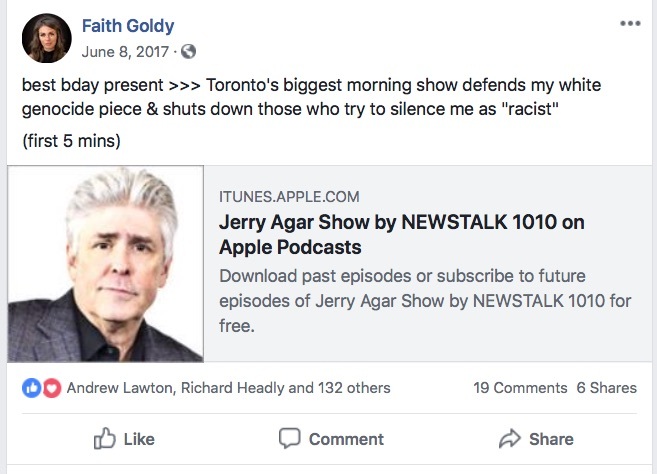 If then-Rebel Media personality Faith Goldy — in attendance that night, by invitation — was troubled by things she heard through the hour preceding her spot on the broadcast, it certainly wasn’t enough to damper how “thrilled” she was to be part of the moment. Goldy’s strategic choice of words — “cultural Marxists” — was instructive. Those aware of the “JQ” know she was “naming the Jew” without naming the Jew. She deliberately spoke in code. Those who took her at her word about her participation having simply been a “poor decision” — at the time, Toronto Sun columnist Joe Warmington asked people to “go easy” on the nearly 30-year-old woman because she was “a good kid” — may well have had reason to offer some benefit of the doubt. It’s entirely possible that, before Charlottesville, they’d paid little mind to Goldy’s ever-rightward trajectory. Goldy has since made her sympathies abundantly clear, and the mainstream right should proceed with caution. Continuing to suggest she’s merely “a conservative voice” means embracing fascist, anti-Semitic, and white supremacist persuasions as part of respectable conservatism and reputable conservative discourse. On CP24, Toronto Sun editor-in-chief Adrienne Batra refers to white nationalist Faith Goldy as a "conservative commentator." Meanwhile, progressives and like-minded organizations should also be careful in how they deal with Goldy’s doomed candidacy. Goldy cannot defend her positions as ably or coherently as her critics fear — there’s a reason she keeps to friendly, sympathetic media and appearances. On the debate stage, she’d have no control over questions, direction, or format. Rather than cede to demands they boycott, her opponents should welcome the opportunity to firmly, unequivocally denounce her beliefs and discredit her candidacy. And it’s crucial that her opponents not preemptively call for her exclusion from any event. Doing so will not only fuel the victim narrative on which she thrives, but will imply a weight of influence she does not carry. There’s as much a threat in over-reacting to a political agitator as there is in not responding forcefully enough. Goldy isn’t as adept or clever as detractors seem to believe, and the illusion of the contrary has long worked to her advantage. Progressives would do well to take a breath, step back, and simply allow others to offer her rope. 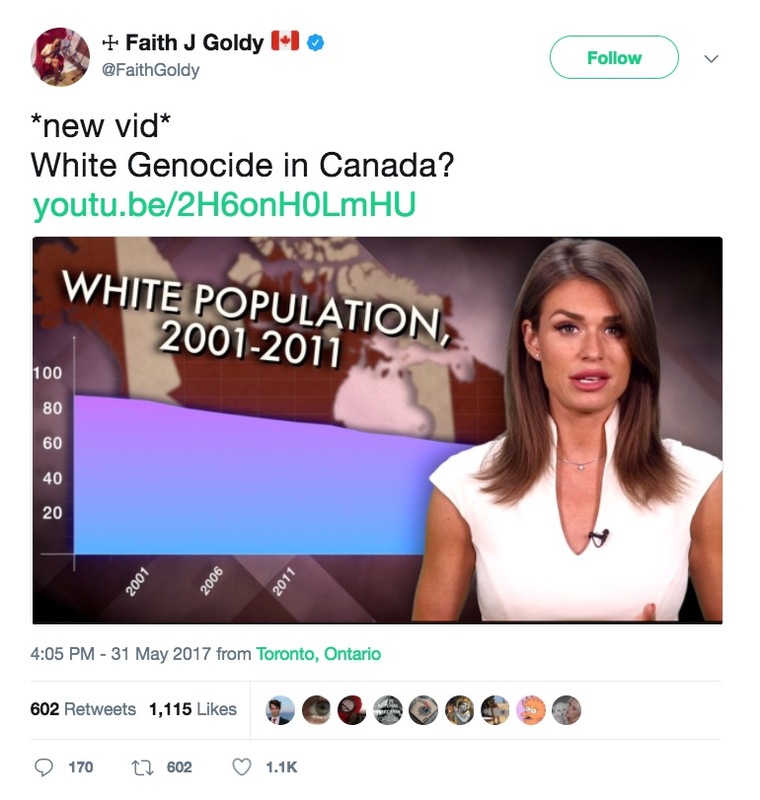 Top image: The thumbnail from Goldy’s “White Genocide in Canada?” Rebel video, published on May 31, 2017, and since taken down.